Hi everyone! 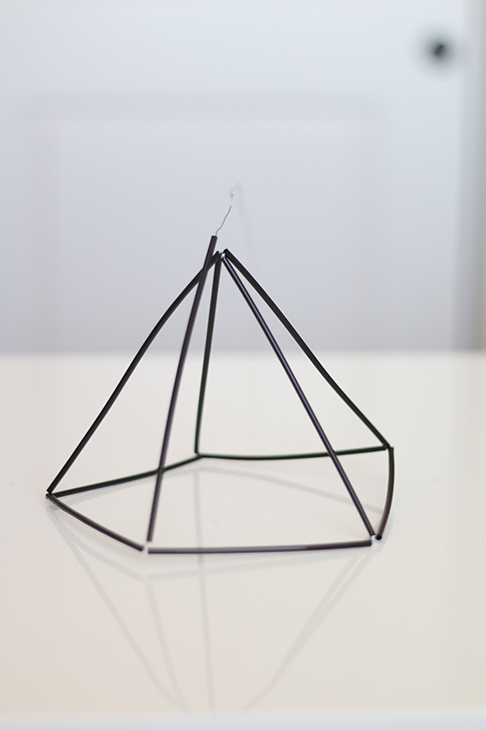 I’ve been seeing a lot of these himmeli geometric sculptures around, either as a hanging ornament or a desktop decorations. Himmeli is a traditional Finnish Christmas decoration, but I guess these forms have been popularize as new modern, sleek decor. 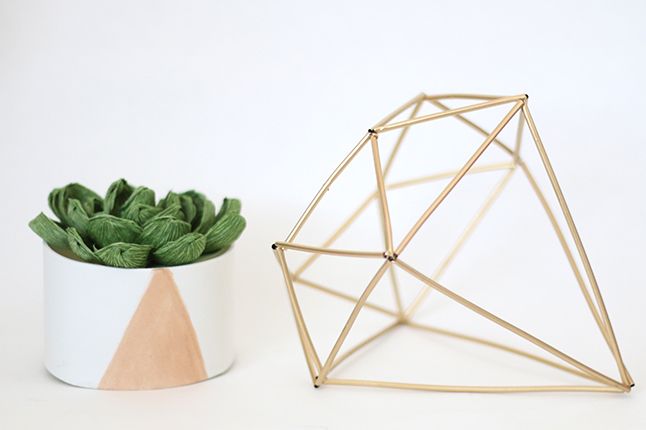 I’ve seen a tutorial using copper tubing, but I wanted something even easier than cutting tubing, so I decided to make these with straws! The straws are easy to cut with scissors and you can spray paint them any color you like after. – Optional: Spray paint – I used the gold from Rustoleum Metallics. First I am going to show you the basics. You don’t need to do this step, you can just follow along so you get the idea. 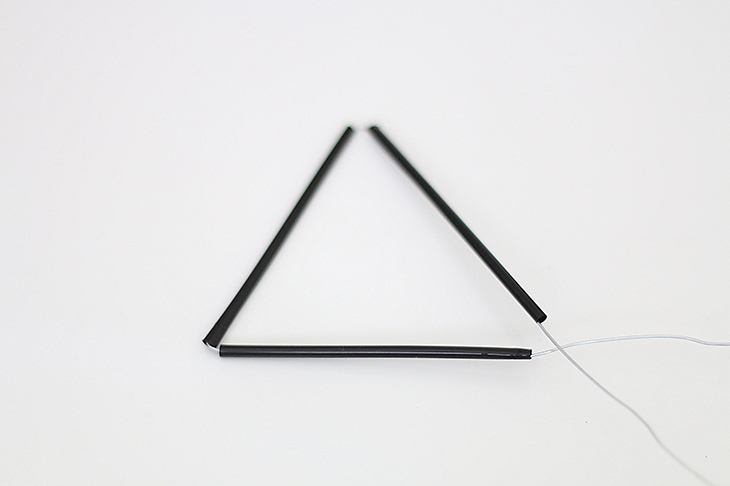 This is how you would form a triangle: First, thread the wire through three straws. Next, bend the wire at a 45 degree angle, right before the second straw. Right before the third straw, bend at a 45 degree angle downwards. 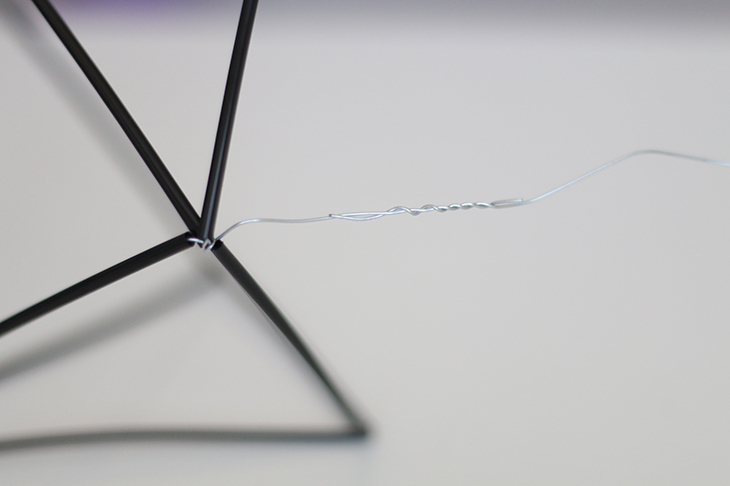 To close off the triangle, you’ll thread the wire through the first straw. So this is how it looks after you’ve threaded the wire through the first straw. 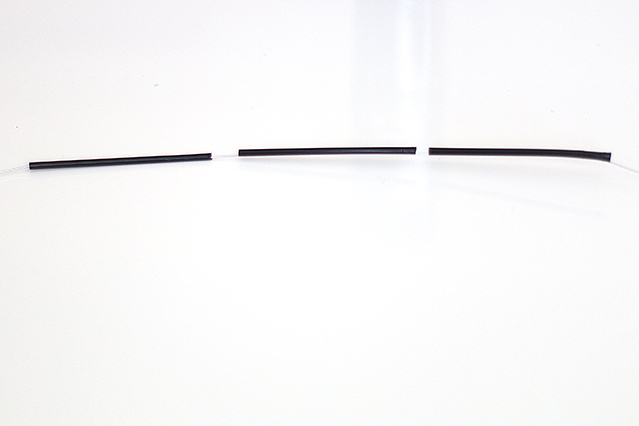 If you ever run out of wire, you can attach an additional piece by twisting and intertwining with the leftover wire. 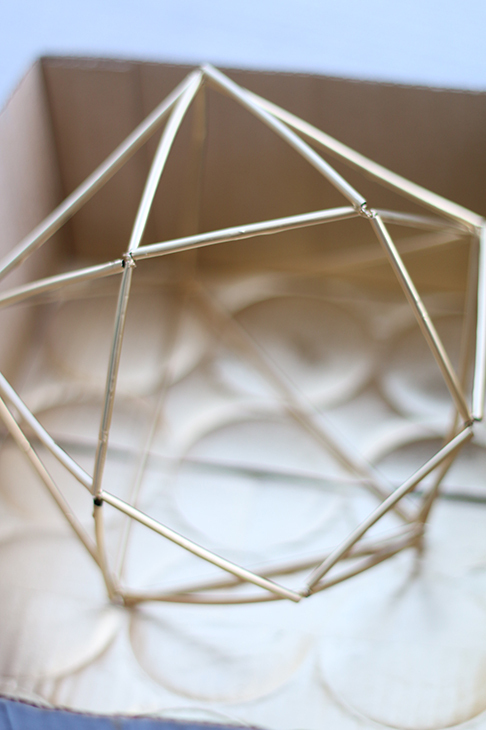 Now that you get the basic idea, we will move onto how I made this diamond piece! You’ll need 5 full length straws, 5 straws cut to 4″, and 15 straws cut to 3″ (which is roughly half the length of a full size straw, so you can just cut them in half too). You will also need to cut a long piece of wire. 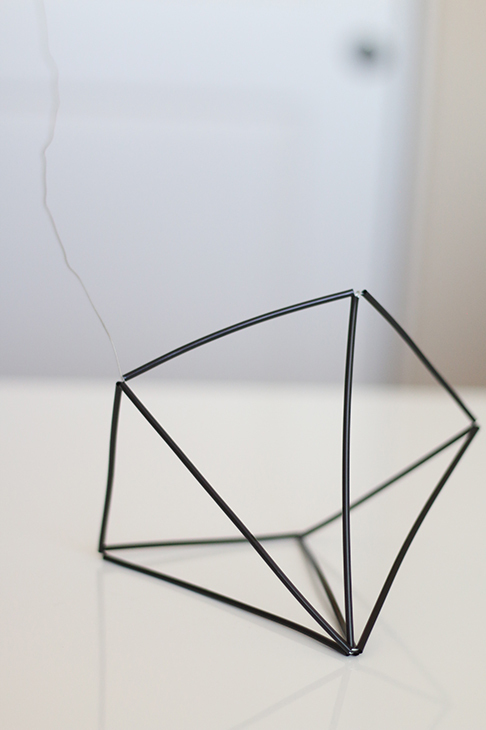 I started with approximately 4′ of wire, but you can always add on or cut off the wire if needed. 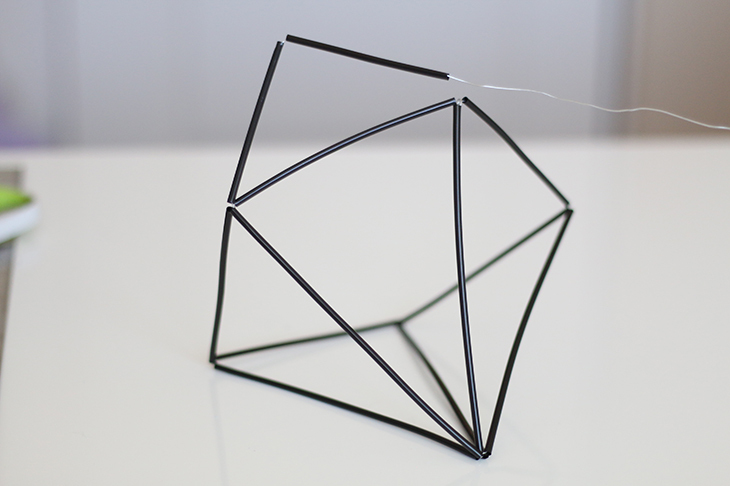 Thread the wire through all five of the 4″ straws to form a pentagon. Leave about 1″ extra wire in front of the first straw. 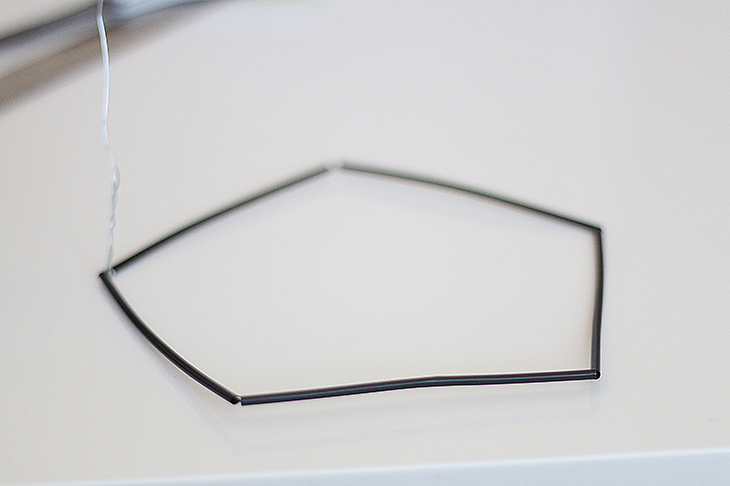 Close off the pentagon by twisting and intertwining the extra 1″ wire with the rest of the wire. 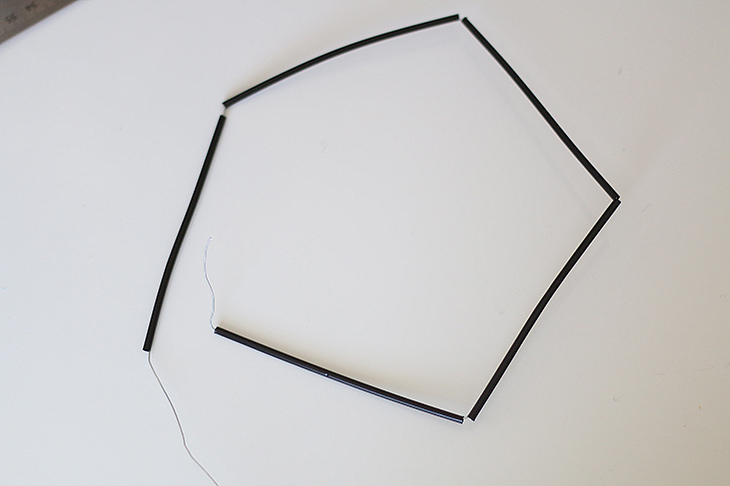 Now, thread one of the full-length straws at a 45 degree angle from the pentagon base. You will be threading all five of the full-length straws in the next few steps. Bend the wire downwards, and thread another full-length straw. Now you need to thread the wire through the straw labelled #1. 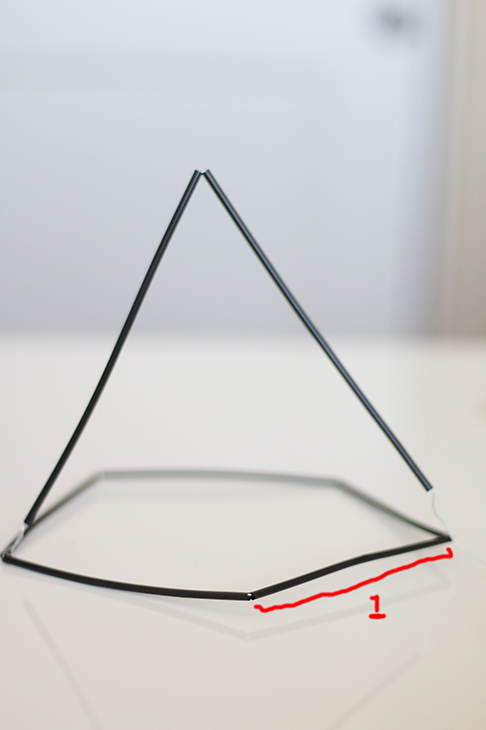 After you have threaded the wire through Straw #1, it should come out of the area marked with the red circle. 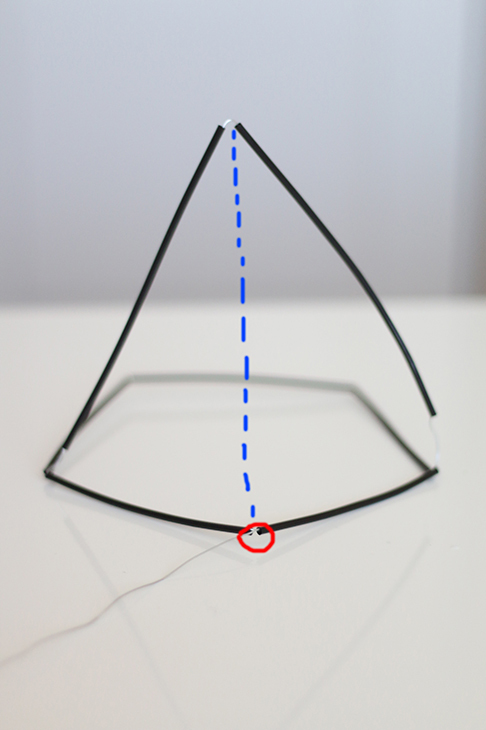 Now, bend the wire upwards so it matches my poorly-drawn dotted blue line and thread in another full-length straw. This is what it should look like at this point. 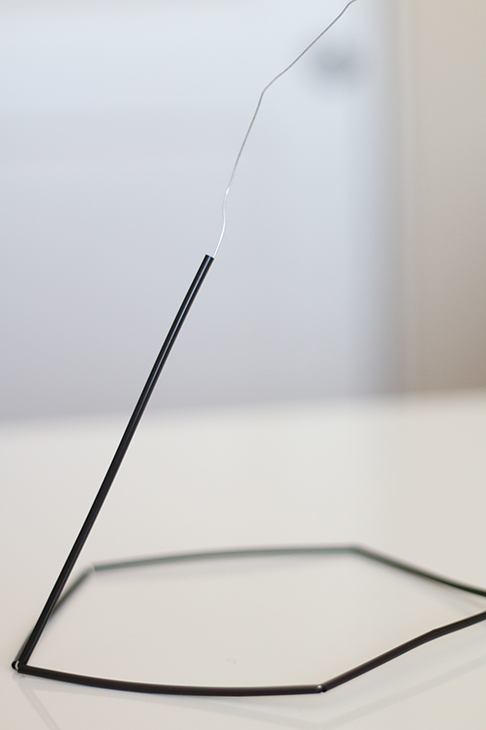 Wrap the wire up and over around the tip to keep the wire in place at the tip. Now bend the wire downward again, thread another full-length straw, and repeat the steps above until you’ve threaded all five of the full-length straws. 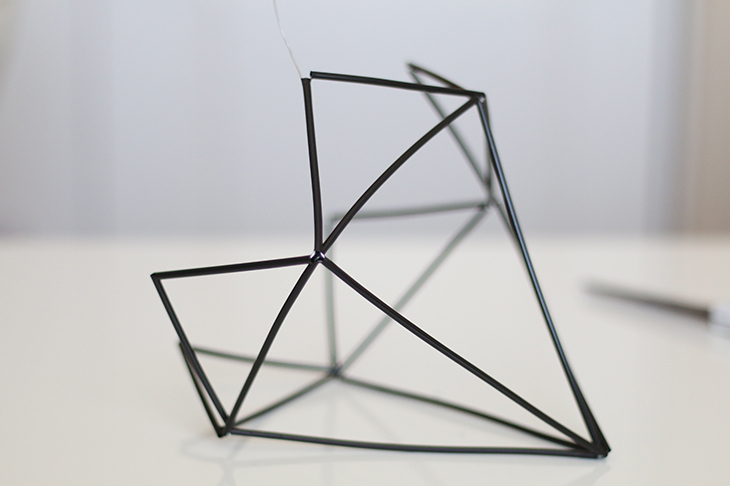 This is the shape you should end up with after threading all five of the full-length straws. Your wire does not need to end up at the tip like mine. 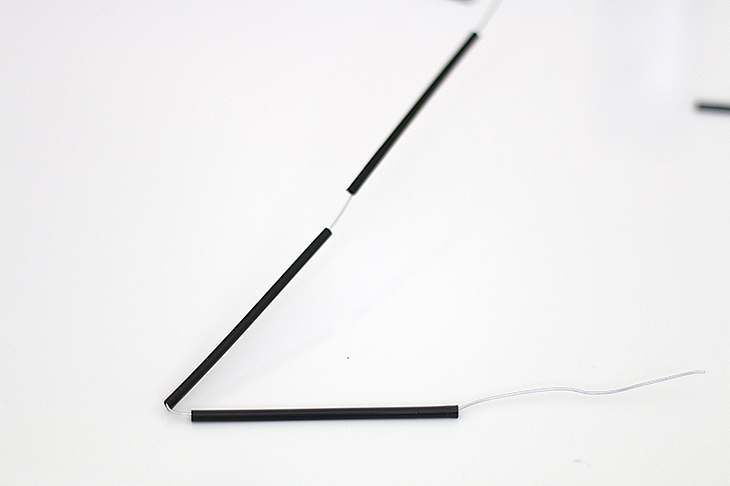 In fact, I had to thread my wire through one of the full-length straws to get the wire to the bottom base. 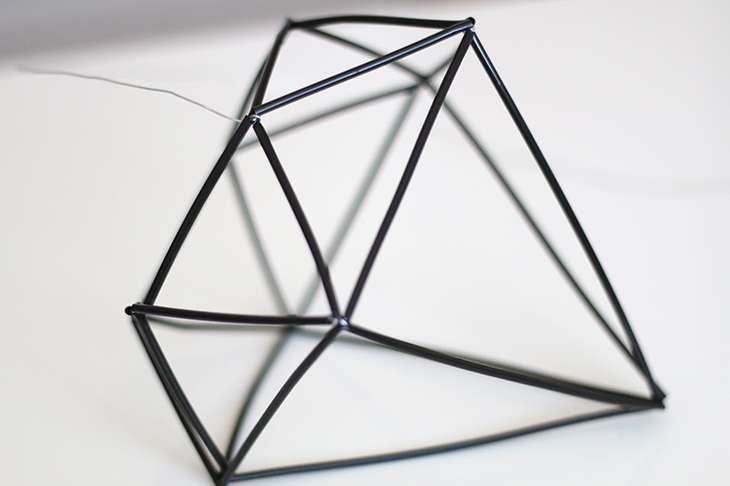 Once you have your wire at the bottom base, you’re going to begin making the facets of the diamond. At this point, you should only have the 3″ straws left. 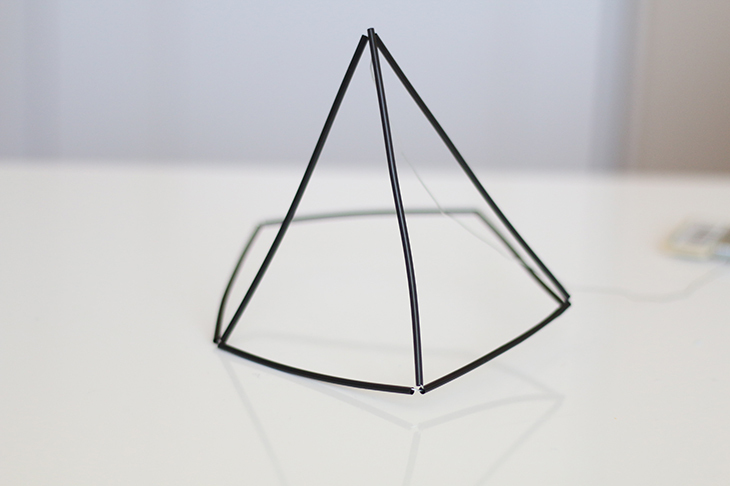 Form a triangle at the base using two of the 3″ straws. 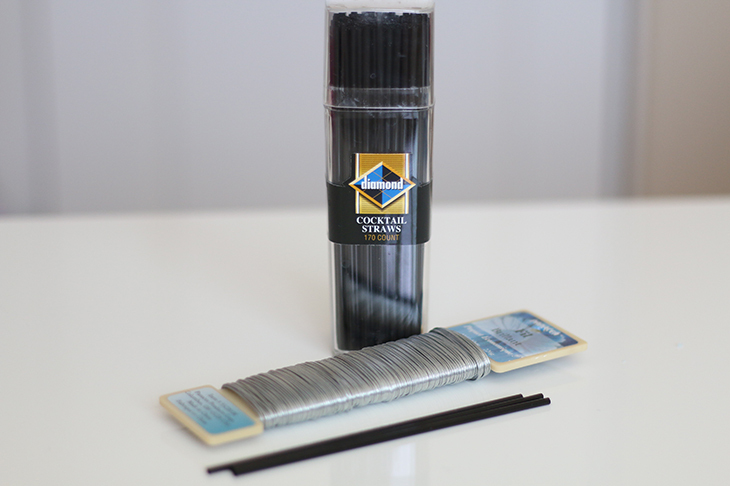 When you get back to the base at the bottom, wrap the wire over and under to secure into place. 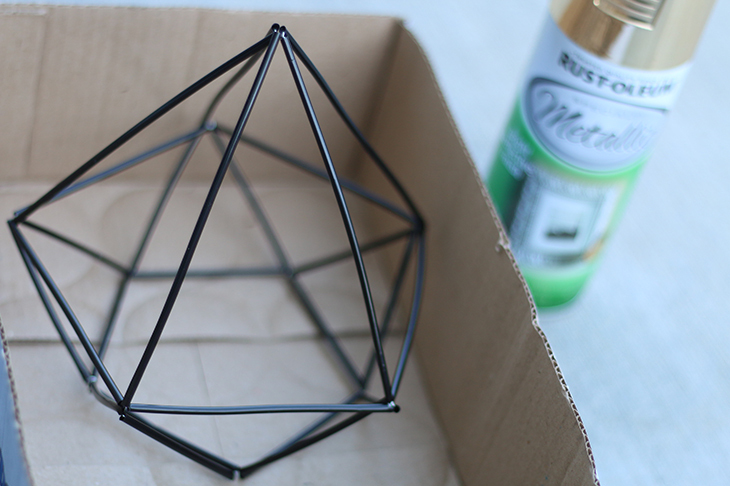 Then repeat the steps all the way around so that you’ve created five triangles around the base. This is what it will look like once you have created the five triangles around the pentagon base. 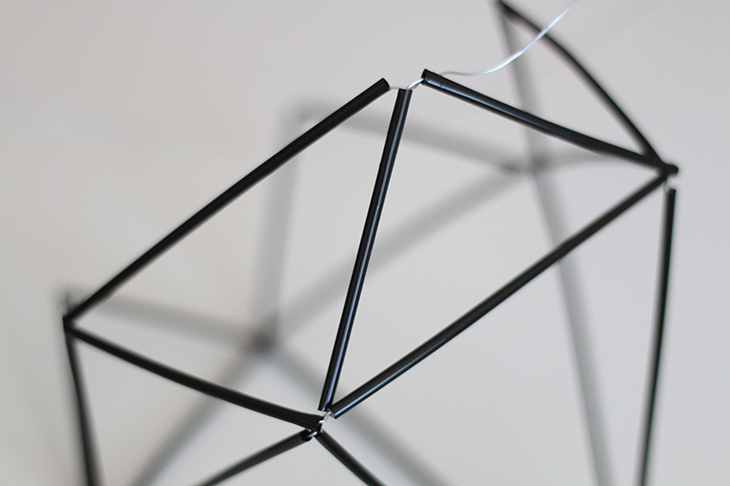 Now you’ll thread straws to connect the tips of the triangles, as pictured above. 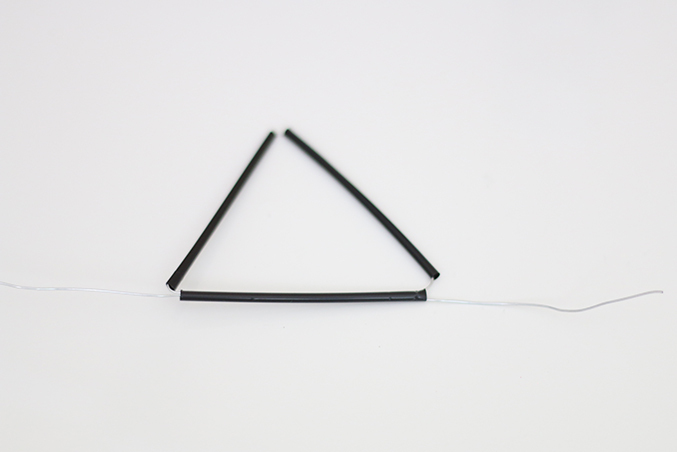 When you get to the tip of the next triangle, again wrap the wire over and under the tip to secure in place. This is what it should look once you are done. Twist the wire over and under a few times to secure it into place. Now you can trim off the excess. I decided to take mine outside for a quick spray painting session. Remember to rotate the sculpture! It will dry in a few minutes and you’ll be ready to hang or place your sculpture wherever you like! 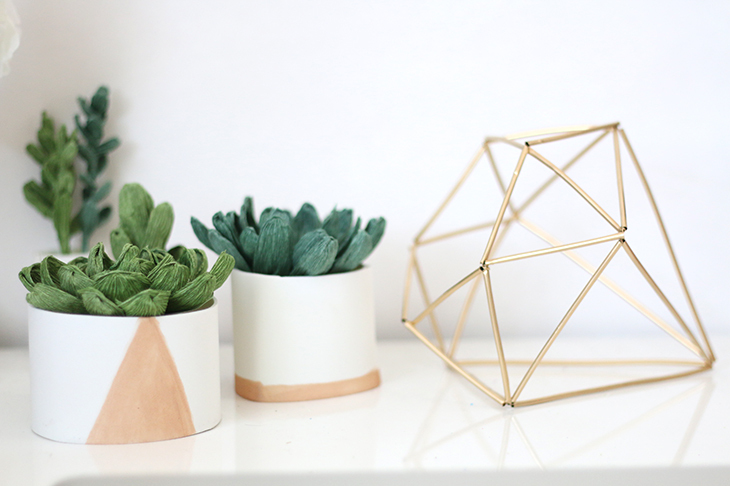 I love seeing these geometric sculptures next to succulents. 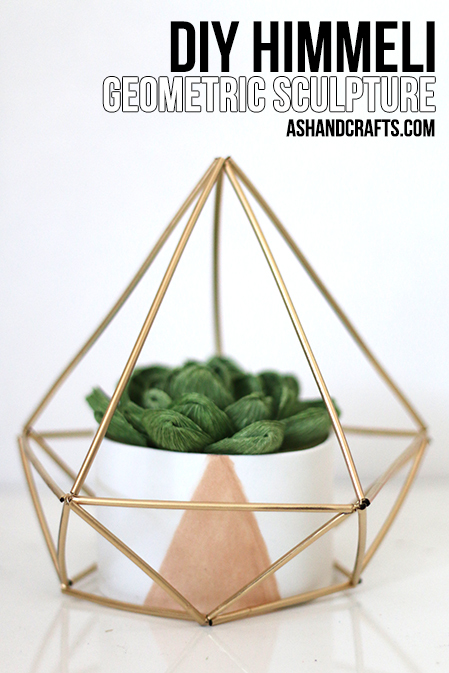 For instructions on how I made these crepe paper succulents, click here! Of course, you don’t have to form a diamond. 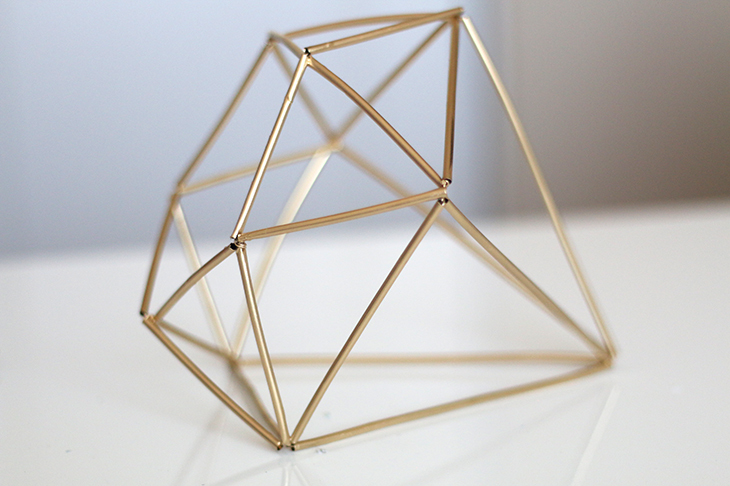 These sculptures would look great with any geometric shape you can come up with. I hope you’ve enjoyed this tutorial. I know some parts can be difficult to understand and it is hard to get a clear photo when the objects are so small and thin! If you have any questions, please feel free to ask me! If you decide to give this project a go, don’t forget to tag me on social media, because I’d love to see your work! I like how used small straws and yet it really looks made of metal. Thanks so much! The gold spray paint is magic! Awesome! I’d love to see them hung with yellow and pink portulaca’s, too! Thank you so much:) I just made one by following Your tutorial Pictures. This was fun and looks very Nice! Love this! Was thinking about making some for decorations for a party. Do you think it would be easier to spray paint all the straws first or is it better to spray paint it after they are all put together? What is the length of the full straws? I’ve been dying to have these for my wedding but they were too expensive to buy – so excited to try these!! Thank you so much!